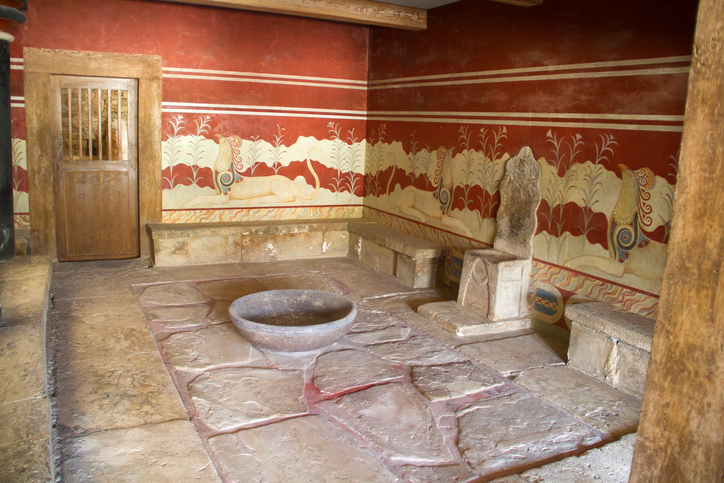 The first flushing toilets in the world might have been the ones used at the Palace of Knossos on Crete over 3,500 years ago! (Waste was washed away by pouring water through stone sluices.) The illustration to the left shows a reconstruction of a tiny section of the so-called palace—a vast and labyrinthine citadel that was wiped out by fire around the 14th century BCE. 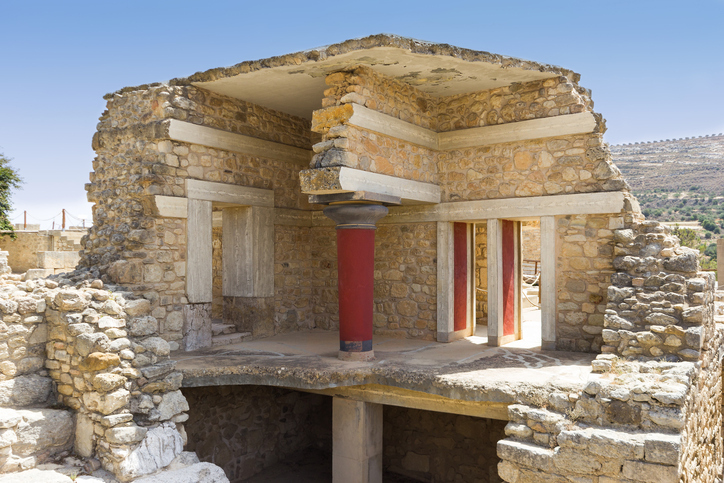 The ruins of Knossos were excavated by the colorful Englishman Sir Arthur Evans: adventurer, reporter, keeper of Oxford’s Ashmolean Museum, and amateur archaeologist. Evans began his work on Crete in 1900, and eventually named the ancient inhabitants of the site “Minoans” after the mythical King Minos, believing he had discovered that monarch’s legendary stronghold. One of Sir Arthur’s many important finds were hundreds of clay tablets (baked by the devastating fire and thus fortuitously preserved) bearing two sets of strange symbols. He dubbed these mysterious scripts Linear A and Linear B. Fifty years later a pair of his fellow countrymen—a former WWII cryptographer and a language savant—deciphered Linear B, revealing that the writing was a form of archaic Greek. Over a century after its discovery, however, Linear A is still unreadable. 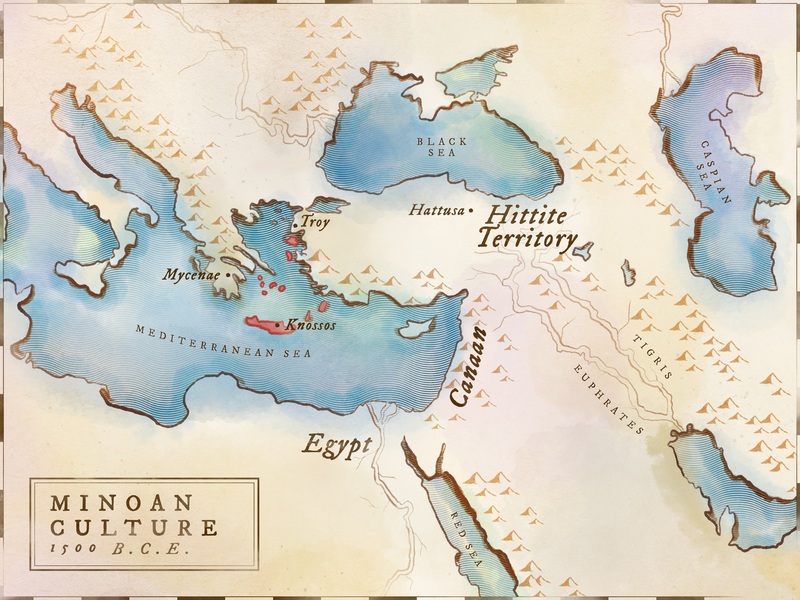 Primitive agricultural communities sprang up around the Aegean Sea by 6000 BCE; but this area lagged behind Egypt and Mesopotamia in cultural advancement. For reasons not yet understood, the island-based Minoan culture suddenly made a leap forward around 2000 BCE and became the first advanced civilization of Europe. The sudden takeoff may have been stimulated by trading contact with Mesopotamia through Levant ports or through contact with Egypt. 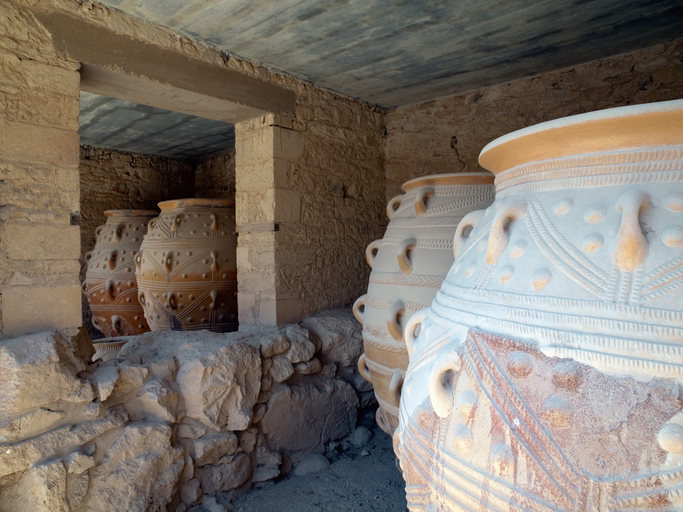 One theory, suggested by Sir Arthur Evans (the amateur archaeologist who unearthed the ruins of Knossos), postulated that refugees from Egypt may have emigrated to Crete and brought technology and ideas with them. But this notion has been invalidated by scientists studying the mitochondrial DNA of samples taken from the teeth and bones of ancient inhabitants of Crete. The Minoan culture was centered on the island of Crete, but extended to other nearby islands, including Thera and Rhodes. They may have colonized the Anatolian coast at Miletus and elsewhere. Through the extension of trade, they influenced the developing Greek culture on the mainland and other Aegean islands. 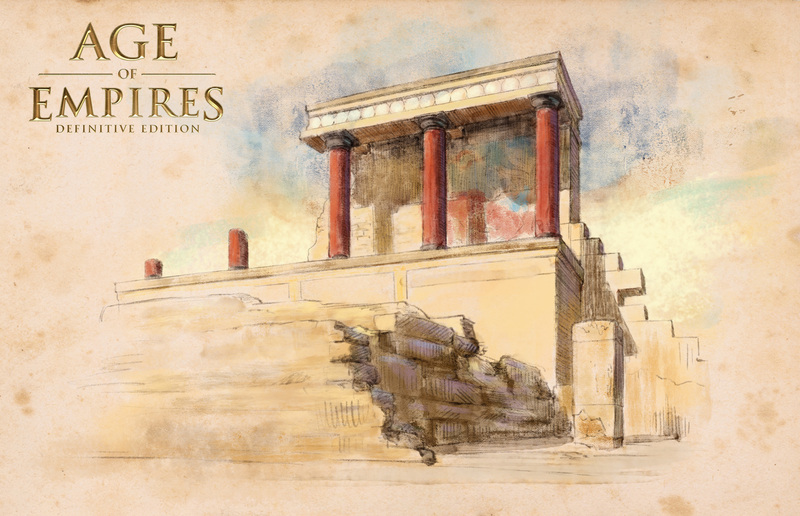 The Palace of Knossos on the Greek island of Crete was the capital of the Minoan civilization. Situated on the Kephala Hill near the modern-day city of Heraklion, the site was first occupied during Neolithic times (c. 8,000 BCE). The Minoans were an economic power, not a military one. They preserved their economic advantage by apparently controlling ship traffic in the Aegean and Mediterranean Seas. For approximately 800 years, they dominated trade in these regions. They were so secure on their islands, protected by their ships, that they never fortified their cities. 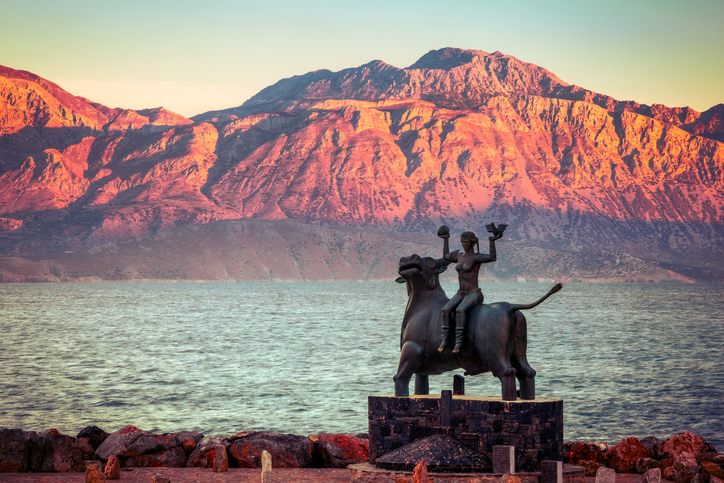 Crete was rich in natural resources, including farmland, water supplies, timber, copper, building stone, and access to the sea. The Minoans were prosperous thanks to agriculture and fishing but grew rich primarily on trade. The high standard of living, the relative abundance of food and other good things, and the security of their island homes gave the Minoans an outlook on life substantially different from other contemporary cultures. Perhaps because life was good, worship and communication with deities was not stressed. They built no great temples. Female goddesses who protected the household, the crops, and the animals dominated their religion. The Minoans may have practiced human sacrifice at one time. There is a famous Greek myth of a minotaur, half man, half bull, who lived in a labyrinth beneath the palace. Young people were sacrificed to the minotaur each year. The high priest or king may have worn a bull mask for the sacrifice, creating the illusion of half man, half animal. They believed in an afterlife and buried the dead with food and possessions that would be of use. The Minoans developed a hieroglyphic writing system around 2000 BCE, perhaps following trading contact with the Egyptians. By 1900 BCE they had developed a new script now called Linear A. Linear B (a third script) came into use at Knossos around 1450 BCE. Surviving artwork shows the people of Crete engaging in the sport of bull jumping. The significance of this activity is not known. Young men and women are depicted approaching a charging bull, grabbing it by the horns, and somersaulting over its back to land behind it. The everyday life of the Minoans was pleasant and relatively free of war and unrest, as witnessed by the richness and exuberance of their frescos, wall paintings, and decorative objects. 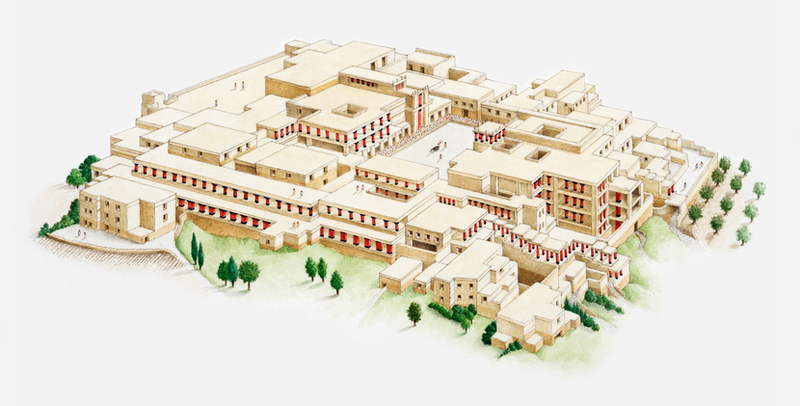 The great palace at Knossos was also a giant warehouse. The distribution of food and other goods may have been organized from here. 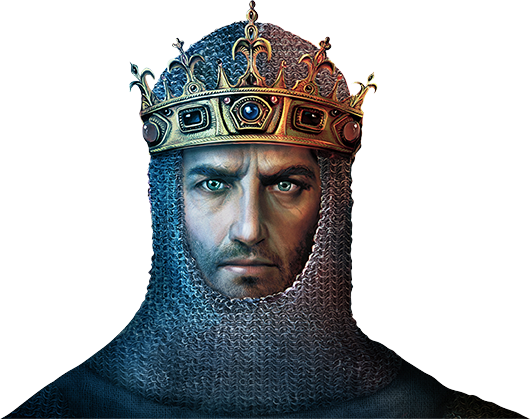 The only king whose name survives was Minos. It may be that the word minos referred to the office, not the man, like the Egyptian term pharaoh. 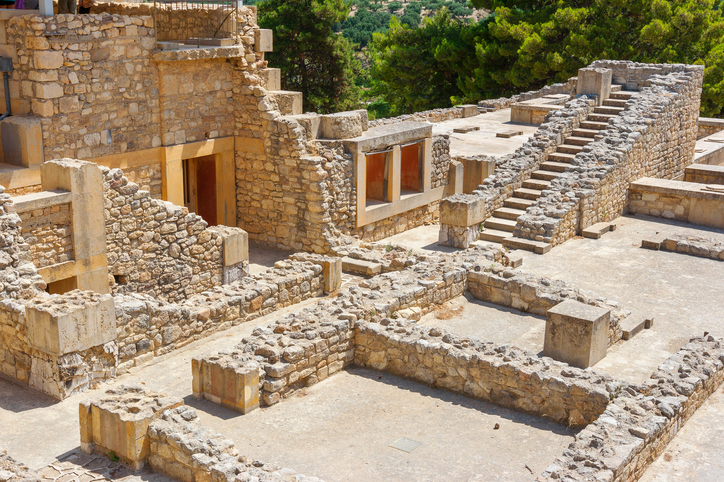 Commonly referred to as “Europe’s Oldest City,” the sprawling Palace of Knossos was spread out over an area bigger than two American football fields (approximately 150,000 square feet or 14k square meters). Consisting of over a thousand rooms, this administrative center had running water, sewers made of clay pipes, multiple stories with porticoes, and vast storage facilities. At its height, perhaps 100,000 people lived in the Palace and the dwellings in the surrounding area. The Palace structures were crafted from wood, limestone and sandstone. Rubble placed between walls may have been used to make them more earthquake-proof by absorbing the shock of the tremors. Distinctive architectural features were carved from alabaster, like the built-in seat in the Throne Room (the benches are made of gypsum). 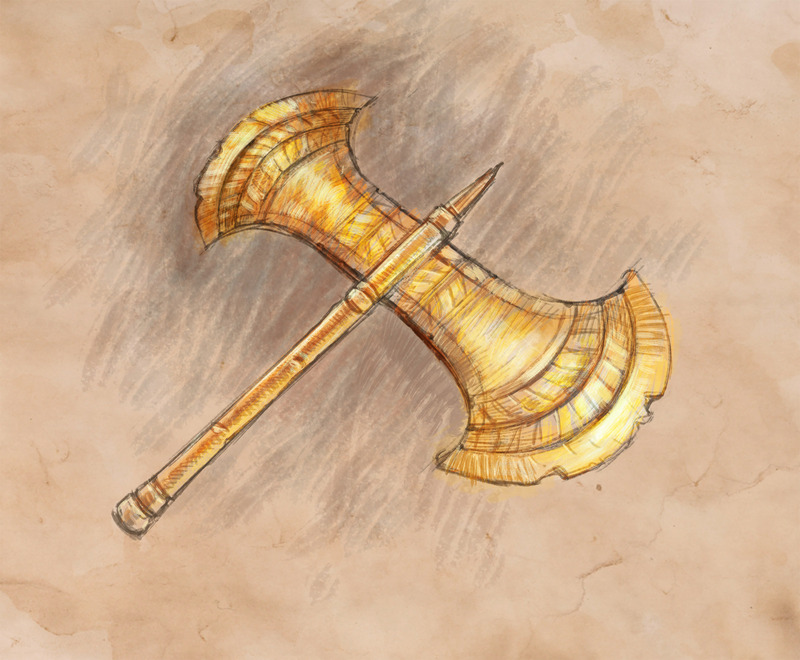 The Minoans had little apparent need for an army, relying instead on their navy to keep any enemies from approaching. Minoan ships were galleys, manned by rowers on both sides. Narrow galleys were fast and maneuverable, allowing them to overtake slower sailing ships of the day. They did not employ rams at this early date, according to the evidence of surviving artwork. 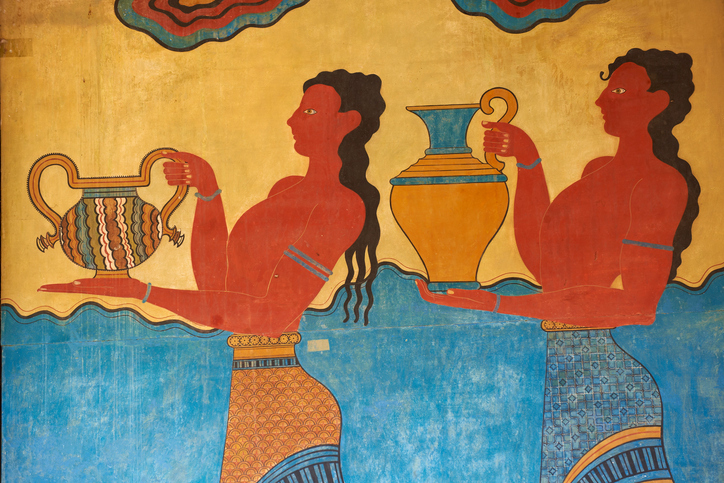 The idyllic life of the Minoans was disrupted by natural disasters. 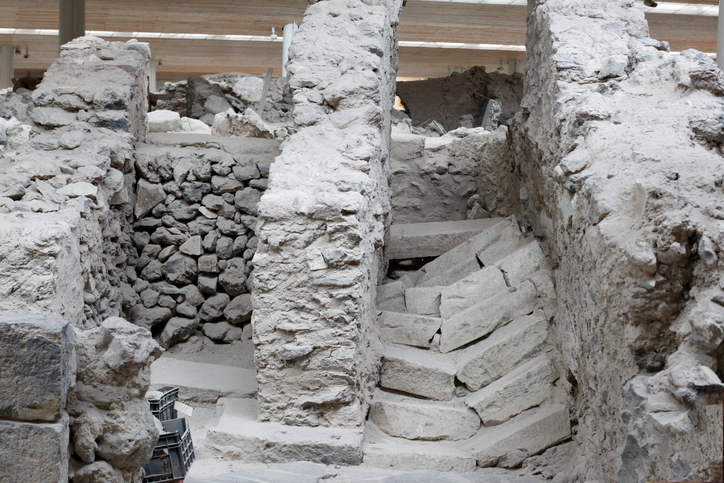 The archaeological remains indicate that the palace of Knossos was destroyed by an earthquake in 1700 BCE and rebuilt. The nearby island of Thera was partially sunk by a volcanic eruption, and the resulting tidal wave probably struck Crete, causing extensive damage. 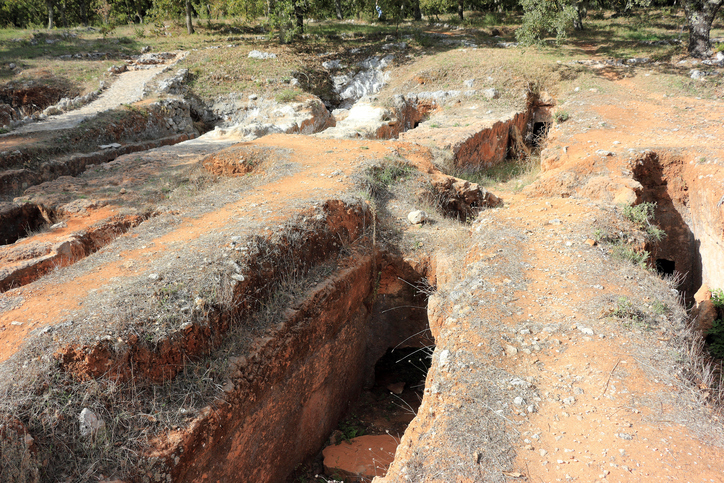 The Minoan culture suffered from recurrent earthquakes and the Thera explosion, but the extent of the damage and its effect on their civilization is debated. There are two main scenarios for the end of the Minoan culture. According to the oldest theory, mainland Greeks invaded around 1420 BCE, essentially destroying the culture, although it lingered for 250 years more until mainland Greece itself was overrun. In the second scenario, based on more recent research, the Minoans suffered a cataclysmic natural disaster resulting in a loosening of their control of sea trade and movement, but did not succumb to the mainland Greeks. External invasions instead destroyed the Minoans, along with the Mycenaeans on the mainland, as part of the so-called Sea People invasion of 1200 BCE. Evidence suggests that by 1180 BCE the Cretans had moved from coastal towns and palaces to defensive city sites high in the hills. Attacks and the threat of further assaults were the probable cause of this shift. Lurking deep in the heart of the Labyrinth beneath King Minos’s palace of Knossos on the island of Crete lived the terrible Minotaur. According to Greek myth, this human-eating monster—half-man, half bull—was finally killed by the wily Athenian hero, Theseus. That famous Greek tale would have been well known to the Englishman Sir Arthur Evans, who began excavating an archaeological site on northern Crete at the turn of the 20th century—a site first discovered by a Greek man named Minos Kalokairinos. After Evans uncovered a sprawling maze-like citadel, as well as incredible frescoes depicting young people leaping over bulls, he assumed he had discovered the legendary palace of King Minos and the home of the Minotaur. 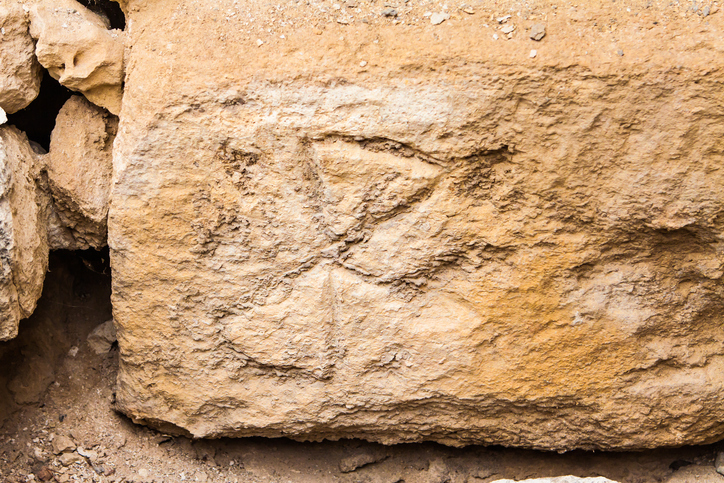 Evans most likely would have been pleased with one of the inscriptions of a clay tablet found at Knossos—an inscription that wasn’t translated until after his death. It mentions “The Mistress of the Labyrinth,” a tantalizing link to the famous mythological maze. 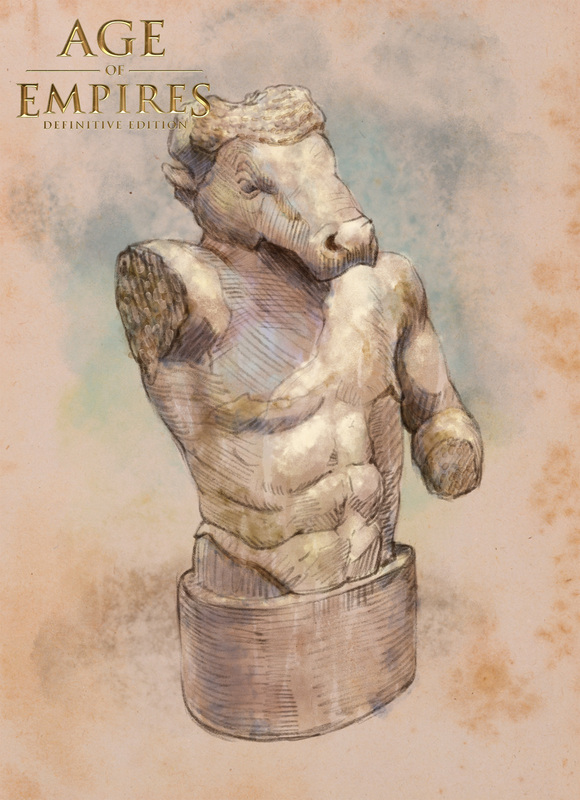 This painting is of a statue of a Minotaur from the renowned collection in the National Archaeological Museum of Greece in Athens. It is a Roman copy of an earlier Greek statue that was found in the Plaka, the neighborhood on the slopes of the Acropolis. It is made of Pentelic marble—stone quarried from Mount Pentelicus, 10 miles northeast of Athens—the same stone that was used to build the Parthenon. 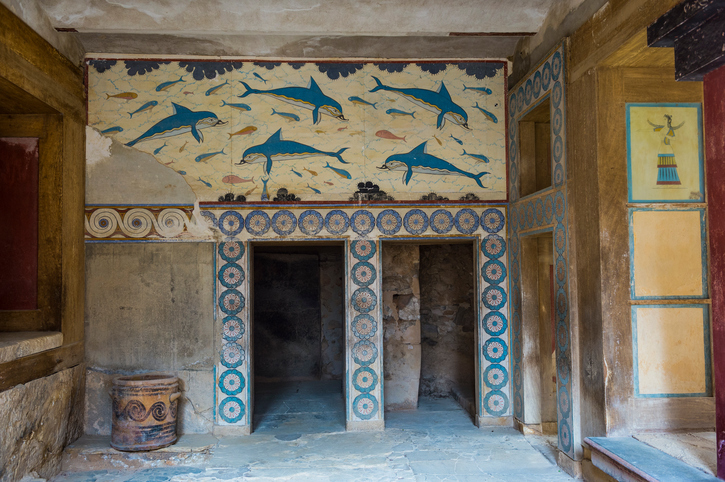 The Minoans are remembered today for their fabulous Palace and frescoes at Knossos, now partially restored. This administrative center/citadel may have been the largest and most beautiful of the late Bronze Age. They are also famous for their mysterious writing systems (some of which continue to defy linguists).